Project X Shafts are the perfect combination of weight and design. Project X shafts work because their designers made them based on the analysis of many golfers swings. To make the perfect golf club, you need to understand the physics behind the shaft and its purpose. They create the ideal transfer of energy from the swing to the ball. A golfer can not only feel this fantastic technology by holding the shaft but can see this as well. Looking for Project X Drivers? Well, look no further than right here. 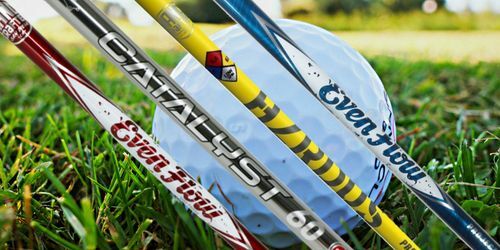 We offer the Project X shafts in a variety of materials such as Project X Hybrids and Project X Irons. Everyone plays the game a little differently. Ensure you have the right club for your style of golf. Should you need assistance, we are glad to help. Finding that perfect Project X Driver is about having fun and enjoying the game. The folks over at Project X take their golf shaft building game very seriously. They figure out the physics behind what the materials capabilities are and use them to your advantage. Having the perfect golf game is the best feeling the world. A great game is achievable by using these handcrafted shafts. They study and document how the materials will react to impact. These studies are what allow them to understand how to make the perfect golf-shaft. The engineers' research, learn and test so you can have the best game of your life. The Project X Hybrids are some of the best in their class. These are more for the aggressive golfer and deliver longer distances without sacrificing control. The various styles and designs offer increased stiffness down the entire length of the shaft. They provide a low spin and launch profile to keep you in control of the ball. Project X Shafts have a robust flow of energy that is smooth while delivering some serious distance.